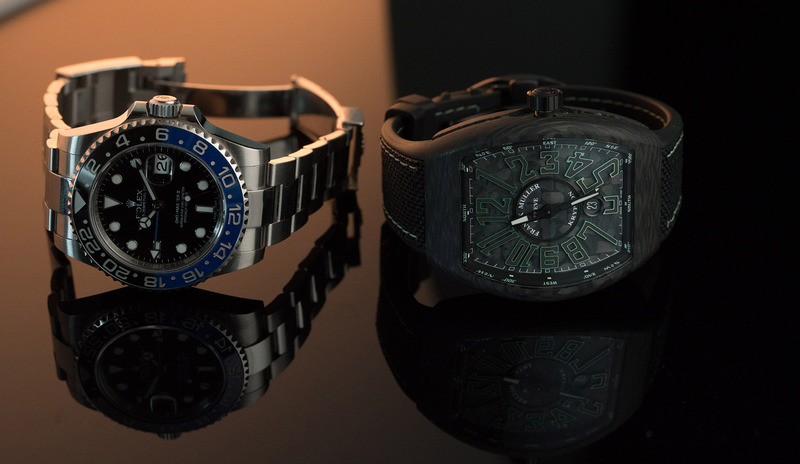 Earlier this year, we witnessed a chance encounter between two giants of both the superhuman and horological pantheons. The showdown took place at dusk, on the shores of Lake Geneva, at Franck Muller’s Watchland. The combatants? 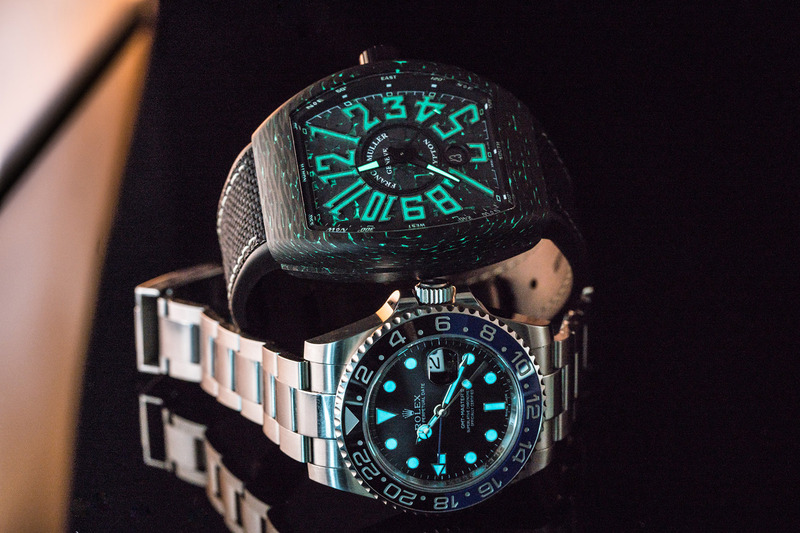 None other than the Batman, in the form of Rolex’s GMT-Master II BLNR, versus Superman, in the shape of the Franck Muller Vanguard Carbon Krypton. The Rolex will be a known quantity to most, but just in case, here’s an excellent review by Bruce (Duguay, not Wayne). Its opponent, however, is probably new to you, a variant of Franck Muller’s sporty Vanguard, the Carbon Krypton. This eye-catching creation features a highly unusual case and dial combination of carbon fibre flecked with Super-LumiNova. By day, the watch is Clark Kent, with a good-looking face and a broad-shouldered 44mm body. By night, the watch transforms into Superman, suffused with the glow of deadly Kryptonite, making it look meaner than ever. 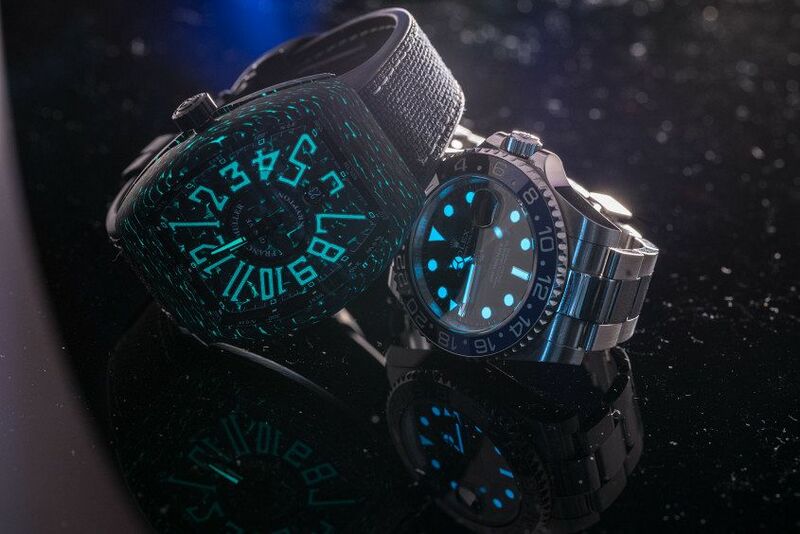 In this battle, the winner won’t be determined by case shape or mechanical prowess, but rather by lume, which is shorthand for luminescence. 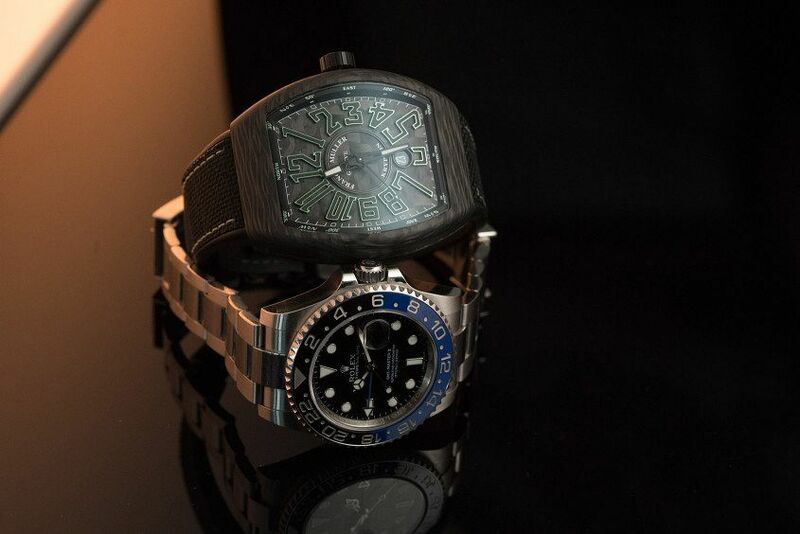 Batman has Rolex’s proprietary Chromalight in his arsenal. The icy blue glow overpowers the Franck Muller’s Super-LumiNova in brightness alone. But in terms of sheer shock and awe and otherworldly impact, the Franck Muller Vanguard’s Carbon Krypton takes the biscuit. Wow factor? Oh yes, there’s that. So it’s fair to say that both superheroes walked away from their night-fight bloodied, but unbeaten. And unlike Ben Affleck, with dignity fully intact.